In the up coming Gnome 2.18, there have been several improvement of the Gnome Power Management applet. It still does the job of easily configuring many options that reduce power consumption. But recently it offers a power history. This functionality is accessible upon right click on the applet icon. It displays a neat little plot of the power level of your battery and of various ACPI-related events (like session idle, suspend, etc.) I find it quite useful to see if the power management policies chosen are applied and if they could be optimised. 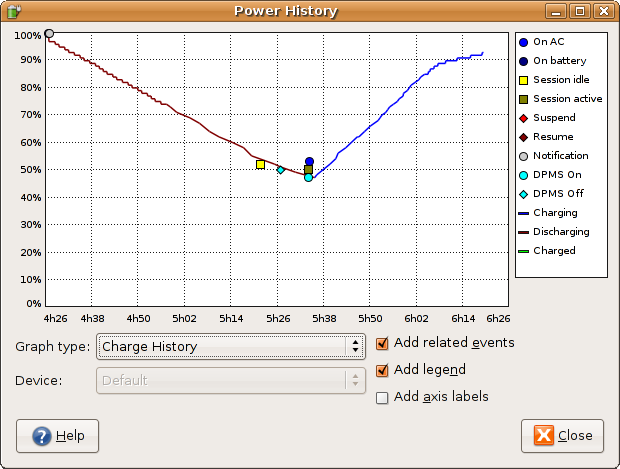 On your right is a screenshot of the power history (click the image to enlarge).